This is Asher (Tidewaters FireQuacker), entered in the puppy stakes of High Flyer's HRC test. 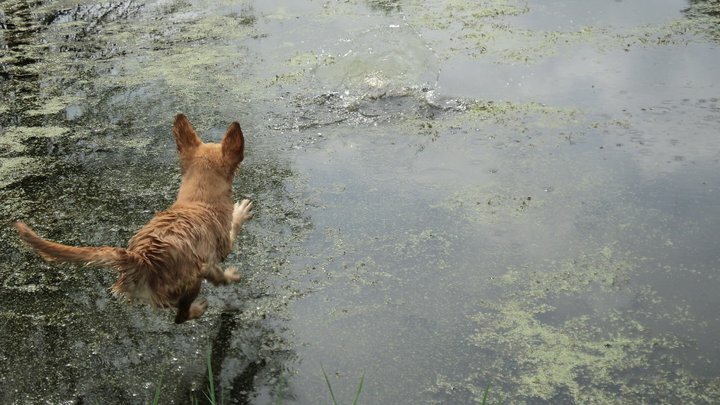 He's 5 months old in this photo and is working on his water entry. I LOVE this photo - it was taken by Asher's owner, Danielle Wilson. LOVE HIM!!!! Thanks for breeding such a fun and comical puppy!! Not much I don't love about him. Ok his Kleenex addiction is bothersome but a lazy owner can fix that one quick!! !